Every shower should be a place of utmost comfort. That can be achieved with the help of different shower fixtures that exist today. They can bring functionality and add a luxurious feel to any showering area. LED showerheads , for one, will help you create a special mood and discover the advantages of chromatherapy. Bluetooth showerheads can offer you the luxury of listening to your favorite music and taking a shower at the same time. High-pressure showerheads can offer a gentle water massage that will help you start the day or unwind after work. Water-saving showerheads will help you reduce your water bills considerably thanks to their low flow. Best shower faucets from brands with a good reputation are some of the most useful and practical shower fixtures that exist today. They can take showering to the next level thanks to their design and practicality. Modern shower faucets can come with a showerhead, with a showerhead and a tub faucet, or with a showerhead, a tub faucet, and a hand held shower. They are made of durable materials to offer perfect performance for many years. Hopefully, our guide and reviews will help you to choose the best shower faucet of 2018. Material. Make sure that the faucet you choose is made of a durable material. When it comes to the bathroom, such rustproof alloys as stainless steel and brass are the best option. They sometimes come with antimicrobial agents or stain-resistant coatings to offer maximum safety and ease of cleaning. Finish. Modern shower fixtures come in a variety of finishes to match a bathroom of any design. The most popular finishes are chrome, brushed nickel, brushed chrome, oil-rubbed bronze, polished brass, polished nickel, and stainless. Make sure that the finish of the shower faucet will complement the finish of the other bathroom fixtures. Number of handles. Shower faucets come with a different number of handles, depending on their functionality and design. Some models come with just one handle for switching between hot and cold water. Other units include two handles for controlling the temperature and the pressure of the water. Some shower faucets come with a three-handle design. Extra features. Some shower fixtures come with higher functionality than others. Some models come with built-in water filters, others with LED lights. There are also units with an adjustable flow rate to minimize water spending or with a scald guard to prevent the water from getting too hot. As with any other product by Delta, with this model, you can be sure of its high quality and flawless performance. Made of premium-class brass, it comes with a lifetime warranty. It comes with a dual handle for adjusting water pressure and temperature. The Linden faucet comes with three water supply modes: an integrated showerhead, a hand shower, and a tub filler. This stylish unit looks elegant and minimalist—a perfect match for any setup. It is available in several finish colors including Champagne bronze, chrome, stainless, and Venetian bronze. This stylish shower fixture will add a special charm to any bathroom. 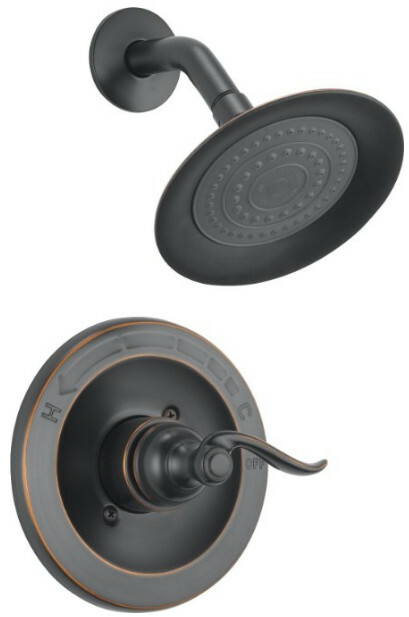 It comes in two finish colors: brushed nickel and oil rubbed bronze. The former is versatile and looks great in a bathroom of any décor, from classic to modern. The latter option will work best with an antique-styled bathroom. The design of the Brantford faucet from Moen comprises a convenient lever handle, a standard showerhead, and a tub-filling faucet. This model is a nice option for a shower/tub combo. This shower faucet will also be a great choice for those who care about the environment, as it is designed in accordance with WaterSense standards. If you are a minimalist, this basic shower faucet from Delta is just the thing for you. This high-quality unit is guaranteed not to rust thanks to the choice of material—it is made of brass. The set includes a showerhead and a handle for water pressure and temperature control. The Windemere from Delta looks stylish and elegant. It has an interesting shape with soft lines and curves that give this model a unique and sophisticated look. 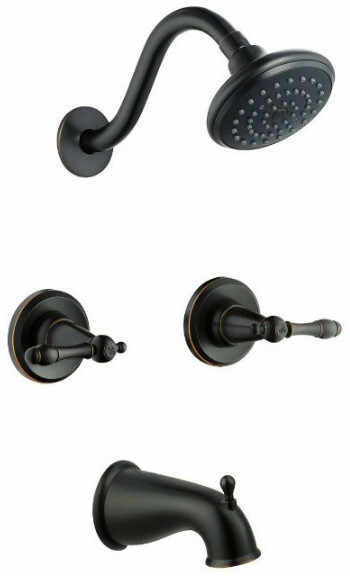 It is available in a few finish options including chrome, oil rubbed bronze, and stainless. With this faucet, you can take an invigorating shower or enjoy a relaxing soak in a bath—both options are available. 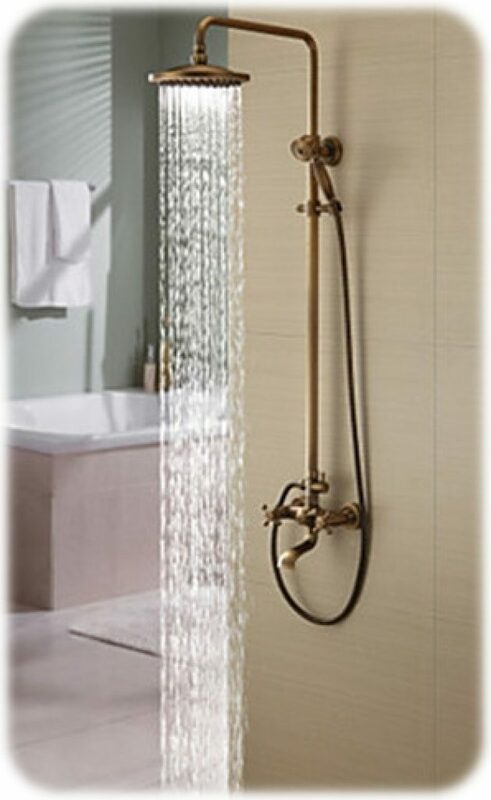 Its sturdy and durable brass construction includes a tub spout, a showerhead, and three lever handles with a unique handle alignment system. 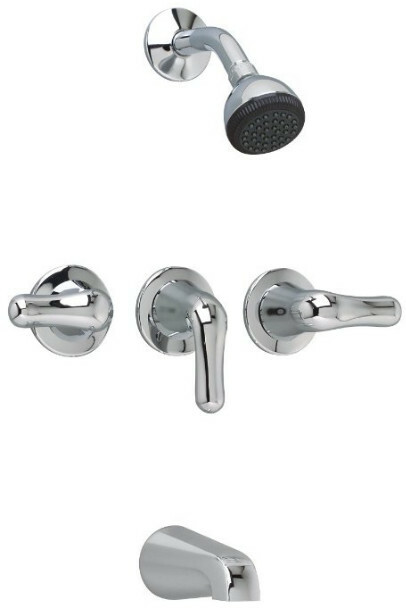 This shower faucet from American Standard comes in two finish options, chrome and chrome brass. The latter looks especially stylish and exclusive. The faucet comes with a ceramic disc valve for high durability and a drip-free performance. This shower fixture has a timeless beauty to it. All of its lines are artfully curved to create a soft and sophisticated look. Every element of this unit—a showerhead on a shower arm, two lever handles, and a tub faucet—is a small masterpiece. The Oakmont faucet from Design House comes with a kit including everything needed for installation. It is made of brass containing parts of zinc and copper, which are known as great antimicrobial agents. This model is available in two finish options—a traditional satin nickel and an extravagant oil rubbed bronze.